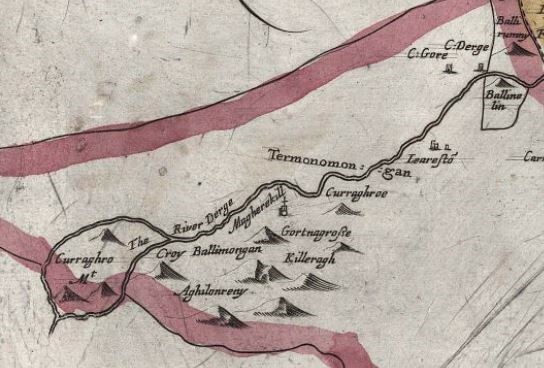 With the 1931 vesting of title to the former termon lands of Termonamongan parish in the occupants of those lands, the residents of the areas around Killeter were freed from a structure of land tenure that, even in the twentieth century, still had features of the medieval and colonial systems from which it arose. They came into the full possession of their land and what they could produce on it, without having tithes or rentals imposed to support payments to bishops or to provide faraway individuals with life incomes. 1 Correspondence regarding this paper may be sent to robertmsimon@gmail.com. 2 Robert King, A Memoir Introductory to the Early History of the Primacy of Armagh (Armagh: John Thompson, 1854), 18, http://books.google.com/books?id=9hcVAAAAQAAJ&pg=PA18. 3 “Tearmann” in Ó Dónaill’s Irish-English Dictionary, http://www.teanglann.ie/en/fgb/tearmann. 4 Testimony of the jurors of Cavan, September 25, 1609, quoted in George Hill, The Conquest of Ireland: An Historical Account of the Plantation in Ulster at the Commencement of the Seventeenth Century (Kansas City: Irish Genealogical Foundation, 2004), 186. 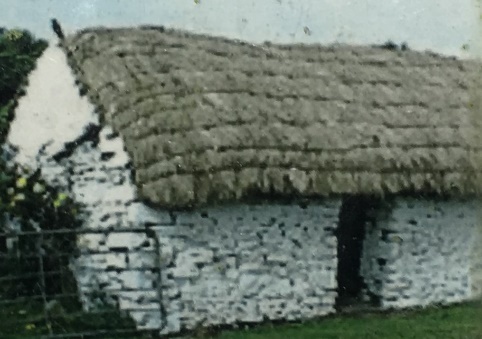 6 British Broadcasting Corporation, “Ireland Before the Plantation: The Religious System,” in “Wars and Conflict: The Plantation of Ulster,” http://www.bbc.co.uk/history/british/plantation/ireland_before/ib03.shtml. 7 Henry A. Jefferies, "Erenaghs and Termonlands: Another Early Seventeenth-Century Account." Seanchas Ardmhacha: Journal of the Armagh Diocesan Historical Society, 19, no. 1 (2002): 55, http://www.jstor.org/stable/29792717. 8 Hill, The Conquest of Ireland, 186. 9 Ulster Inquisitions, Appendix, county Tyrone, seventh page. 10 Henry A. Jefferies, “Derry Diocese on the Eve of the Plantation,” in Derry and Londonderry: History and Society, ed. Gerard O’Brien (Dublin: Geography Publications, 1999), 181. 11 Brian Mac Cuarta, “The Catholic Church in Ulster under the Plantation, 1609-1642,” in The Plantation of Ulster: Ideology and Practice, ed. Éamonn Ó Ciardha and Micheál Ó Siochrú (Manchester: Manchester University Press, 2012), 121. 12 “Square-shaped bell of iron, coated with bronze, from Termon Moncan, Lough Derg, Ireland,” Museum reference X.KB 5, National Museums Scotland, http://www.nms.ac.uk/explore/collection-search-results/?item_id=14499. 13 John R. Walsh, “The Early Church,” in History of the Diocese of Derry from the Earliest Times, ed. Henry A. Jefferies and Ciarán Devlin (Dublin: Four Courts Press, 2000), 39 (note citing article by C. Bourke on “Early Irish Hand-Bells”). 14 Tom Gallen, “Aghyaran Parish, County Tyrone,” http://tomgallen.com/2014/09/aghyaran-parish-county-tyrone/. 15 Thomas M. Landy, “St. Patrick’s Purgatory, Lough Derg,” https://www.catholicsandcultures.org/ireland-republic-ireland/st-patricks-purgatory-lough-derg. 17 Ciarán Devlin, “The Formation of the Diocese,” in History of the Diocese of Derry from the Earliest Times, ed. Henry A. Jefferies and Ciarán Devlin (Dublin: Four Courts Press, 2000), 102, 104. 18 Annala Uladh: Annals of Ulster otherwise Annala Senait, Annals of Senat, Corpus of Electronic Texts Edition T100001B, entry U1290.15, http://www.ucc.ie/celt/published/T100001B/index.html. 19 Charles Dillon and Henry A. Jeffries, ed., Tyrone: History and Society (Dublin: Geography Publications, 2000), 109. 20 Brian Bonner, Derry: An Outline History of the Diocese (Dublin: Foilseacháin Náisiúnta Teoranta, 1982), 105. 21 “Metropolitan Visitation of the Diocese of Derry, A.D. 1397 (Concluded).” Ulster Journal of Archeology, First Series, 1 (1853): 240, http://www.jstor.org/stable/20563466. 22 Dillon and Jeffries, Tyrone: History and Society, 109. 24 Brendan McGinn, “The Founding Fathers,” http://www.parishofaghyaran.com/thefoundingfathers.htm. 25 Hill, The Conquest of Ireland, 186. 26 Jeffries, "Erenaghs and Termonlands,” 56. 27 King, Memoir Introductory, 31. 28 Pawlisch, Sir John Davies, 11. 29 Pawlisch, Sir John Davies, 62. 30 L. Ó Mearáin, “Miler McGrath, Archbishop of Cashel (1571-1622),” Clogher Record, 2, no. 3 (1959): 445. http://www.jstor.org/stable/27695482. 31 “Indenture with Donoghoe Magrath, alias Gillagruama Magragh, gent., chieftain of Tearmonde Magragh, and of his name, in the province of Ulster,” Fiant No. 5993, May 5, 1596, in “Fiants of the Reign of Queen Elizabeth – (continued),” appendix 4 of Seventeenth Report of the Deputy Keeper of the Public Records in Ireland (Dublin: The Queen’s Printing Office, 1885), 32-33, http://books.google.com/books?id=_lURAQAAMAAJ&pg=PA32. 32 “Grant (under queen’s letter, 9 Aug., xxxiv) to Donoghe Magrath, chief of Thearmond Magrathe; of all castles, manors, lands, and hereditaments surrendered by him (5993) known by the name of Thearmond Magrath and Thermond Imonghain, in the province of Ulster,” Fiant No. 5997, May 13, 1596, in “Fiants of the Reign of Queen Elizabeth – (continued),” 33-34. 33 Trinity College Dublin, “The Down Survey of Ireland. Map Sources,” http://downsurvey.tcd.ie/map-sources.html. 34 Trinity College Dublin, “The Down Survey of Ireland. Down Survey Maps. The County of Tyrone,” http://downsurvey.tcd.ie/down-survey-maps.php#c=Tyrone&indexOfObjectValue=-1&indexOfObjectValueSubstring=-1. 35 The explicit mention of Seegronan Townland in the bounds of the termon land prompts a question. Seegronan Townland is the location of a stone cross and other “standing stones” of great age. Might they have been erected to serve as boundary markers for the termon land? 36 Henry A. Jefferies, “Bishop George Montgomery's Survey of the Parishes of Derry Diocese: A Complete Text from c. 1609,” Seanchas Ardmhacha: Journal of the Armagh Diocesan Historical Society, 17, no. 1 (1996-97), 57, 73, http://www.jstor.org/stable/25746733. 37 Jefferies, “Bishop George Montgomery’s Survey,” 79. 38 John McCavitt, “Nine Years War,” http://www.theflightoftheearls.net/nine_years_war.html. 39 Pawlisch, Sir John Davies, 67-73. 40 Henry A. Jefferies, “George Montgomery, First Protestant Bishop of Derry, Raphoe and Clogher (1605-1610),” in History of the Diocese of Derry from the Earliest Times, ed. Henry A. Jefferies and Ciarán Devlin (Dublin: Four Courts Press, 2000), 143-144. 41 Jeffries, “George Montgomery, First Protestant Bishop,” 150. 42 Roddy Hegarty, Imeacht Na nIarlí -- The Flight of the Earls: 1607 – 2007 (Armagh: Ó Fiaich Memorial Library and Archive, 2010), 9, 18. 43 Hill, The Conquest of Ireland, 66. 44 Hill, The Conquest of Ireland, 80. 45 Hill, The Conquest of Ireland, 69. 46 Hill, The Conquest of Ireland, 92. 47 Hill, The Conquest of Ireland, 181. 48 Hill, The Conquest of Ireland, 193. 49 John Davies, “A Brief of the Proceedings of the Commissioners for the Plantation in Ulster since July last, as well in Ireland as in England,” March 19, 1609-1610, quoted in Hill, The Conquest of Ireland, 206. 50 Hill, The Conquest of Ireland, 210. 51 Hill, The Conquest of Ireland, 183. 52 “Grant from the King to James Magrath of Termon-Magrath, Esq.” (Patent Roll 8 James 1, Part 3, No. 27), in Calendar of the Patent Rolls of the Chancery of Ireland (Dublin: 1800), 187, http://books.google.com/books ?id=XD5JAAAAcAAJ&pg=PA187. 53 “Grant (under queen’s letter, 9 Aug., xxxiv) to Donoghe Magrath,” 34. 55 Jonathan Bardon, The Plantation of Ulster: British Colonisation of the North of Ireland in the Seventeenth Century (Dublin: Gill and MacMillan, 2011), 211. However, see also Tarquin Blake, “Abandoned Ireland: Termon McGrath Castle, Co. Donegal,” which ascribes the building of Castle McGrath to Archbishop McGrath. http://www.abandonedireland.com/ Termon_McGrath_Castle.html. 56 George Downham and William A. Reynell, “’The Estate of the Diocess of Derry’ Part I,” Ulster Journal of Archaeology Second Series, 1, no. 3 (1895): 165-177, http://www.jstor.org/stable/20563573. 57 George Downham and William A. Reynell, “’The Estate of the Diocess of Derry’ Part V – Jurisdiction,” Ulster Journal of Archeology Second Series, 3, no. 1 (1897): 56-57. 58 Downham and Reynell, “Part V – Jurisdiction,” 56. 59 Hill, The Conquest of Ireland, 125. 60 These included his father-in-law, George Tuchet (11th Baron Audley and 1st Earl of Castlehaven), Tuchet’s two sons (Mervyn and Ferdinando Tuchet), and the husband of Tuchet’s eldest daughter Ann (Edward Blount or Blunte). Sir John Davies had married Tuchet’s youngest daughter, Eleanor. See Hill, The Conquest of Ireland, 268-271. 61 Hill, The Conquest of Ireland, 271. 62 Hill, The Conquest of Ireland, xiii. 63 Hill, The Conquest of Ireland, 268. 64 John Norden, “Ulster” (ca. 1609), British Library Online Gallery, http://www.bl.uk/onlinegallery/onlineex/ unvbrit/u/001cotaugi00002u00044000.html. 65 “Books of Survey and Distribution,” https://en.wikipedia.org/wiki/Books_of_survey_and_distribution. 66 Trinity College Dublin, “The Down Survey of Ireland. GIS Sources. Related Historical Records,” http://downsurvey.tcd.ie/gis-sources.html. 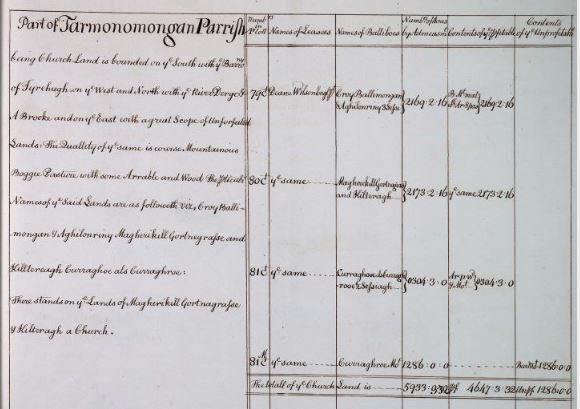 67 Trinity College Dublin, “The Down Survey of Ireland.” Depiction of the holdings of the Dean Wilson in 1641 and 1670, http://downsurvey.tcd.ie/landowners.php#l1=Wilson,+Dean&l4=Wilson,+Dean&mc=54.652518,-7.68802&z=12. 68 Trinity College Dublin, “The Down Survey of Ireland. Down Survey Maps. 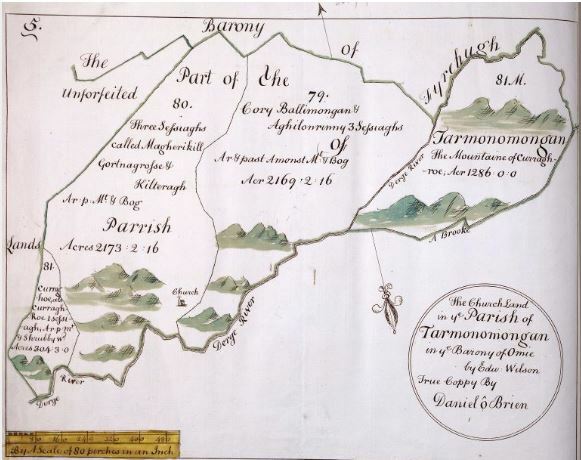 Tarmonomongan Parish, Omagh, Tyrone,” http://downsurvey.tcd.ie/down-survey-maps.php#bm=Omagh&c=Tyrone&indexOfObjectValue=-1&indexOfObjectValueSubstring=-1&p=Tarmonomongan. 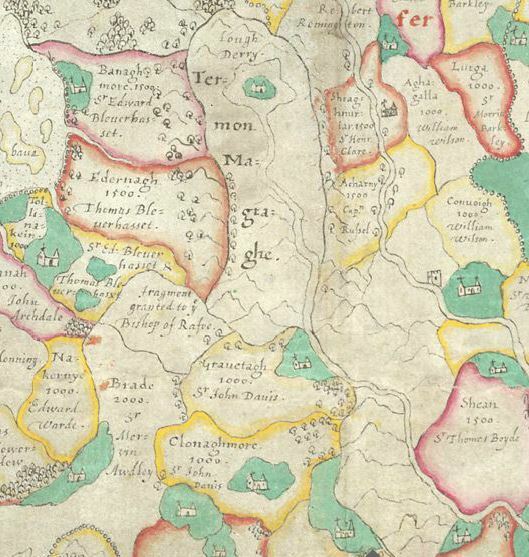 The original map is in a volume of late eighteenth-century copies of Petty's Down Survey maps of the Counties of Down, Armagh and Tyrone in the Public Record Office of Northern Ireland, PRONI Reference D597/4/1. Reprinted with permission of PRONI. 69 It is not entirely clear whether the name “Dean” is a first name or an indication that he is a Dean of the Anglican Church in Ireland. On the one hand, “Dean” seems like an unusual first name for the seventeenth century. On the other hand, a listing of Deans of the Anglican Diocese of Derry from this period does not include a Dean with the surname Wilson. The acres were by estimation only, and differed considerably. The origin of this measure (the acre) would lead me far beyond the present subject; but, for example, there were in times comparatively recent, the "large acre" and the "small acre", with no fixed ratio between them; and even now the acre differs: the Cunningham acre; the plantation and statue [sic] acre. The areas of the Ordnance Survey are all in statute acres. 71 Pawlisch, Sir John Davies, 28. 72 Robert C. Simington, The Civil Survey – A.D. 1654-1656. Vol. III – Counties of Donegal, Londonderry, and Tyrone (Dublin: Stationery Office, 1937), 349. 74 Gordon Goodwin, “Hastings, Theophilus,” in vol. 25 of Dictionary of National Biography 1885-1900, ed. Leslie Stephen and Sidney Lee (London: Smith, Elder & Co., 1891), 135-136, https://en.wikisource.org/wiki/Hastings,_ Theophilus_(DNB00). 75 Hill, The Conquest of Ireland, 83. 76 Sir Patrick Hamilton is identified in the PRONI catalogue as the lessee referred to in a 1774 letter concerning the tenants of Termonamongan Parish (PRONI Reference D2798/3/19). This letter is reproduced in Appendix A and is discussed later in this paper. 77 Charles H. Elsley, Church Leases Considered (London: James Ridgway and Sons, 1837), 6-16. 78 Everard Hamilton, Hamilton Memoirs: Historical and Genealogical Notices of that Family Which Settled in Ireland in the Reign of King James I, 2nd ed. (Dublin, private publication, 1920, typed copy with additional text supplied by Colin F.B. Hamilton published on the Internet in 2003), chapter II (n.p. ), http://www.stirnet.com/articles/ selectfams/HamiltonMemoirs/CH2.html. 79 Ulster Ancestry, “The Papers of the Abercorn Estate, Ardstraw, County Tyrone,” http://www.ulsterancestry.com/newsletter-content.php?id=20. 80 Hamilton, Hamilton Memoirs, chapter II. 83 Hamilton, Hamilton Memoirs, chapter VIII. 84 In the “Conveyance in Perpetuity of the Lands of Termonomongan [sic] County Tyrone” from the Commissioners of Church Temporalities in Ireland to Hugh Lyons Montgomery and St. George Smith, dated September 4, 1872, and reproduced in Appendix D, it is stated on page 2 that the conveyance did not include “the House belonging to the Rector of Termonamungan [sic] aforesaid and Twenty acres of land lying convenient to said House which was made Glebe to the Reverend William Reed formerly Rector thereof….” Reverend William Read was Rector of Termonamongan Parish from 1702 to 1716. 85 Hamilton, Hamilton Memoirs, chapter VIII. The year of birth is estimated from the statement that he was 17 years old when he matriculated at Trinity College Dublin in 1700. 86 His name and these dates appear in a list of the succession of clergy in Termonamongan Parish in George Downham and William A. Reynell, “’The Estate of the Diocess of Derry’ Part II – The Deanry of Mohey,” Ulster Journal of Archaeology Second Series, 1, no. 4 (1895): 251, http://www.jstor.org/stable/20563596. 87 Hamilton, Hamilton Memoirs, chapter VIII. 88 Downham and Reynell, “Part II – The Deanry of Mohey,” 251. 89 Letter of Matthew Galbraith, Killeter, to the Bishop of Derry, August 22, 1774 (PRONI Reference D2798/3/19). Reproduced in Appendix A. 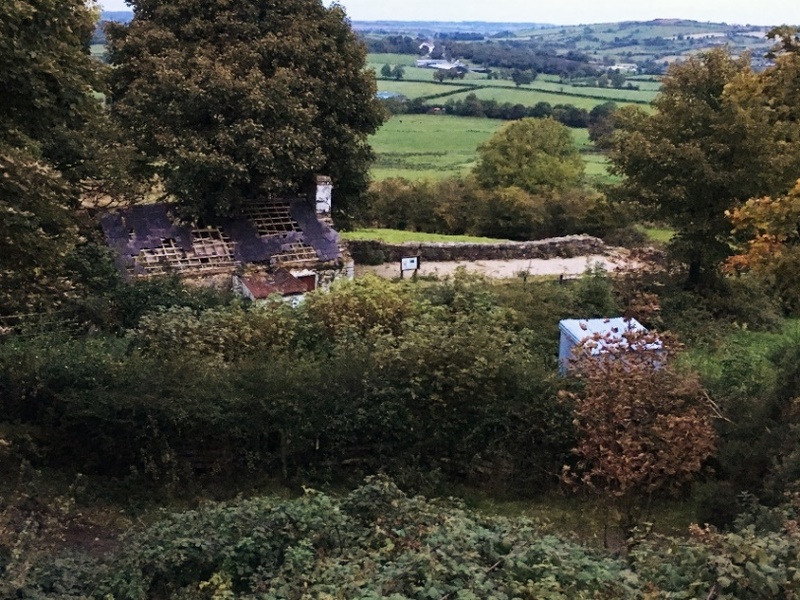 90 Downham and Reynell, “Part II – The Deanry of Mohey,” 251. He served in Killeter from 1771-1812. 91 Hamilton, Hamilton Memoirs, chapter VIII. 92 Hamilton, Hamilton Memoirs, chapter VIII. 93 In the “Conveyance in Perpetuity of the Lands of Termonomongan [sic] County Tyrone” from the Commissioners of Church Temporalities in Ireland to Hugh Lyons Montgomery and St. George Smith, dated September 4, 1872, and reproduced in Appendix D, it is stated on page 1 that “said Henry Smith was Assignee of The Reverend William S. Hamilton….” The lands were part of the will of Henry J. Smith, dated February 3, 1857 (PRONI Reference LR1/2344/1). 94 Abstract of Title for the Holdings of the Estate of Fitzhenry Augustus Smith in County Tyrone, prepared by Dickie & Carson, Solicitors, Omagh, and submitted to the Court of the Land Purchase Commission of Northern Ireland on March 7, 1931, p. 6 (PRONI Reference LR1/2344/1/A11). Reproduced in Appendix B, p. 7. 95 “Derry” in Crockford’s Clerical Directory (London: Church House Publishing), http://www.crockford.org.uk/ historical-successions/derry. Bishop William Knox of Derry served from 1803 to 1831. Since the reference in the Abstract of Title was not to a late Lord Bishop of Derry and Raphoe (as the two dioceses were merged in 1834), this reference could not be to Bishop William Higgin (1853-1867) of the combined diocese. 96 Bernard Burke and Ashworth P. Burke, “Smith of Annesbrook,” in A Genealogical and Heraldic History of the Landed Gentry of Ireland, 9th ed. (London: Harrison & Sons, 1899), 413, https://books.google.com/books? id=Ha0EAAAAIAAJ&dq=burke'%20target%3D'_blank'%20rel%3D'noopener%20noreferrer%20nofollow's%20landed%20ireland&pg=PA413#v=onepage&q&f=false. 97 “Will of Henry J. Smith, Esq.,” dated February 3, 1857, a copy of which was submitted to the Court of the Land Purchase Commission of Northern Ireland on March 7, 1931 (PRONI Reference LR1/2344/1/C). Reproduced in Appendix C.
98 Abstract of Title for the Holdings of the Estate of Fitzhenry Augustus Smith in County Tyrone, p. 4 (PRONI Reference LR1/2344/1/A11). Reproduced in Appendix B, p. 5. 99 Richard Griffith, General Valuation of Rateable Property in Ireland. Union of Castlederg. Valuation of the Several Tenements Comprised in the Above-Named Union, Situate in the County of Tyrone (Dublin: Alex Thom and Sons, 1859), 19-31, http://www.askaboutireland.ie/griffith-valuation/. 100 “Landlord Liberality.—An Example Worthy of Imitation,” Morning News (Belfast), October 9, 1862, 3, col. 2, http://www.britishnewspaperarchive.co.uk/viewer/bl/0000428/18621009/009/0003?_=1478269160669. 101 Burke and Burke, “Smith of Annesbrook,” 413. 102 Abstract of Title for the Holdings of the Estate of Fitzhenry Augustus Smith in County Tyrone, p. 5 (PRONI Reference LR1/2344/1/A11). Reproduced in Appendix B, p. 6. 103 “Conveyance in Perpetuity of the Lands of Termonomongan [sic] County Tyrone” from the Commissioners of Church Temporalities in Ireland to Hugh Lyons Montgomery and St. George Smith, dated September 4, 1872 (PRONI Reference LR1/2344/1). Reproduced in Appendix D. One provision in the conveyance dealt with the future production of grain on the lands, mentioning that the principal grain grown at the time of the purchase was oats. 104 Abstract of Title for the Holdings of the Estate of Fitzhenry Augustus Smith in County Tyrone, p. 5 (PRONI Reference LR1/2344/1/A11). Reproduced in Appendix B, p. 6. 105 “Frederic Augustus Smith VC,” Lord Ashcroft Medal Collection, http://www.lordashcroftmedals.com/ collection/frederick-augustus-smith-vc/. 106 Abstract of Title for the Holdings of the Estate of Fitzhenry Augustus Smith in County Tyrone, pp. 7-8 (PRONI Reference LR1/2344/1/A11). Reproduced in Appendix B, pp. 8-9. 107 The deed is summarized in the 1931 Abstract of Title and the original is in the Land Purchase Commission records at PRONI (PRONI Reference LA1/2344/A/7). 108 “Settlement on the marriage of FitzHenry Augustus Smith, Esq., with Miss Kathleen Muriel Travers,” December 31, 1909, a copy of which was submitted to the Court of the Land Purchase Commission of Northern Ireland on March 7, 1931 (PRONI Reference LR1/2344/A/5). Reproduced in Appendix E.
109 “Probate of the Will and three Codicils of Fitz Henry Augustus Smith, Esquire,” dated November 7, 1930, as submitted to the Court of the Land Purchase Commission of Northern Ireland, p. 6, item 14 (PRONI Reference LR1/2344/1). Reproduced in Appendix F, p. 5. 110 “Probate of the Will and three Codicils of Fitz Henry Augustus Smith, Esquire,” p. 1. Reproduced in Appendix F, p. 2. 111 Land Purchase Commission, Northern Ireland, “Final List No. 2148, Estate of Fitzhenry Augustus Smith,” Belfast Gazette, 502 (February 6, 1931), 119.